Window Switch is a tool which allows you to move applications between networked computers, the windows appear where you need them, as they were. You no longer need to save and send documents to move them around, simply move the view of the application to the machine where you need it. * Portable: the code should be portable to almosty any platform, from mobile phones to data centers. * Secure: It uses strong cryptography to authenticate both the server and clients. * ZeroConf: using mDNS, local servers are detected automatically. * Simple Line Protocol: the protocol used to communicate between the client and server is a simple single line text protocol. * Performance: the system can preload sessions and tunnels, which makes starting new sessions very fast. * Flexible: the sessions are accessible from Window Switch, but also using xpra directly, any NX client or any standard VNC client. * Integration with file managers: Windows Explorer (on Windows) and Nautilus on Linux. * Using blueproximity or similar tools, you can get the windows to follow you around without having to touch the computer. Window Switch will simply re-connect the windows to the computer which is nearest to you. * Sound redirection: start playing some music on one computer, move the window to another, and the sound will go with it. The public key is unavailable… Has anybody got it? Even after that i can’t get it installed using maverick. Missing packages, or the wrong version. Oh man, if only this project can merge with Quick/Synergy, … it’d be the bomb! Agreed with BlackDex. Unable to meet dependency issues on Maverick. Mirrored both the windowswitch and winswitch repos at http://nwlinux.us with no luck. Anyone get this to install? Finally installed properly using my mirror site (http://nwlinux.us/sources.list) on a fresh install. If your primary box is Linux and you are trying to pull programs from Windows, similar to Terminal Services, it is not worth the hassle. The Linux client cannot pull individual programs, only the full screen. In essence, you are simply using a VNC session. 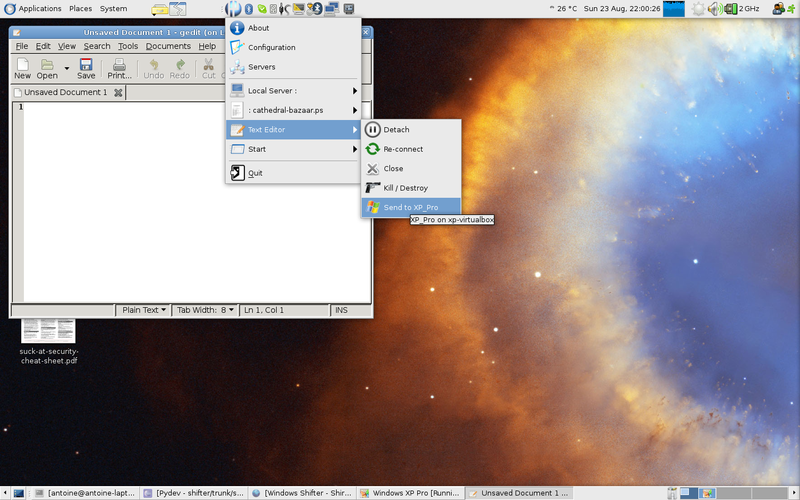 However, if you are using a Windows box as the primary box, you CAN use individual Linux programs on your Windows box. Pretty neat. Anyone try the Mac version? Apologies to those who tried to download DEBs (Ubuntu/Debian) before yesterday afternoon, the http redirect was broken. The dependencies are also fixed (needed to be re-generated). Sorry about that. Should be ok now, post to the mailing list if you have any problems and I’ll make sure to fix them. The Mac OSX version is less “mature” but should mostly work. Confirmed. Thanks for the update Antoine. Mirrors are updated. I’ll be posting a write-up soon. The packages for Ubuntu are broken as there is a bug in /usr/lib/python2.6/winswitch/utils/paths.py, lines 126 and 128: replace libexec with lib, and only then the program runs. TBH, packaging for MS Windows and OSX is bad enough, I am really losing all patience with Linux distros doing their own thing wrt to paths. Can’t wait for them to deal with the packaging themselves so I can focus on real features rather than path workarounds.